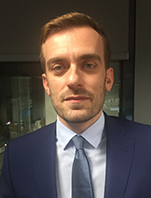 Vassilis Kotsiras is heading the Funding Solutions and Structured Finance Division at National Bank of Greece since 2015. He has more than 12 years of working experience in the banking sector in London and Athens specializing in Investment Banking and Treasury Solutions. He has been involved in a number of corporate and financial institutions funding transactions and has a deep knowledge of structured finance instruments and techniques. He holds a B.A. in Economics from Athens University of Economics and Business, and an M.Sc in Management from the Cass Business School.